We will communicate with you through Iran Cultural and Educational Center (ICEC) website and ICEC email group. Please check this website regularly for information and updates. The information regarding unexpected school closing due to inclement weather condition or any other reason will be posted here. You may also check school operation section in the middle of the home page, as shown below, to find out about schools closing. Emails from ICEC, to communicate events, news, and school operation status. Please check your email and also spam or promotional folder to see if our emails are there and move them to your inbox. 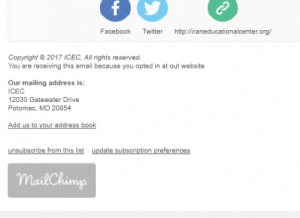 At the bottom of ICEC emails, there is an option that you can use to update your preference to get email from different committees or use unsubscribe option if you are no longer affiliated with the ICEC and wish to be removed from the email list. This entry was posted in Alumni News, Parents new, Principal & Teachers Corner, uncategorized on September 29, 2017 by ICECadmin.